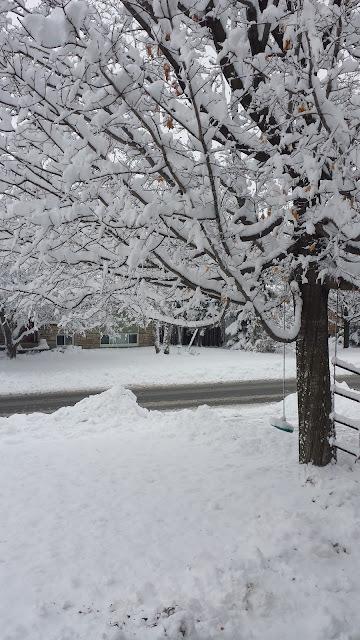 Got our first big snowfall of the year! FACES OF MOVEMBER POST ON FATEKEEP IS A MUST SEE! It's November again and Movember Canada fundraisers and participants are busy trying to raise awareness and funds for men's health issues. Not surprisingly, our friends at Fatekeep are involved, since Fatekeep is all about social good and giving back. Here are some awesome #FacesOfMovember! Why not support their efforts by donating to their campaigns. If that wasn't enough Fatekeep is having a giveaway to support their efforts! Note: I have not been compensated in any way for this post. All opinions are completely my own. Cathy Thinking Out Loud is a mix of opinions, knowledge sharing, and blurbs about great products that work for a woman approaching mid-life. Cathy has moved passed the busy messy baby parenting stage into the busy messy teen parenting stage. With that comes a change in focus, rethinking of retirement, finances, relationships, health, and life goals. 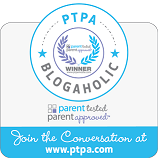 That thinking is done out loud on Cathy Thinking Out Loud Blog. THOUGHTFUL GIFT IDEAS YOU MAY NOT HAVE THOUGHT OF! I often struggle with what to give friends and family that seem to have everything. Here are a few gift ideas you may not have thought of, but that are very thoughtful gifts! I am loving COZI Family . It is a free calendar and organization app, that you can upgrade to the paid option of COZI GOLD. Great for keeping all the busy family schedules connected and up to date. I especially love the lists function for Groceries, Packing etc. Be sure to visit the Cozi Site for tons of great recipes, meal ideas, and tips on everything from travel to finance. NETFLIX CANADA allows you to stream movies and shows to your TV or other devices like a tablet, or phone. Perfect for Snowbird parents, your kids, or for a carpooling Mom who is sitting waiting at yet another game or lesson. You can get a 1 month trial for free, and it is only $7.99 per month for the service should you decide to sign up. You may require a Media Player such as the Roku which can be purchased for under $100. You can give the gift of personal security to yourself, family and friends by sharing and downloading REACT Mobile free app. 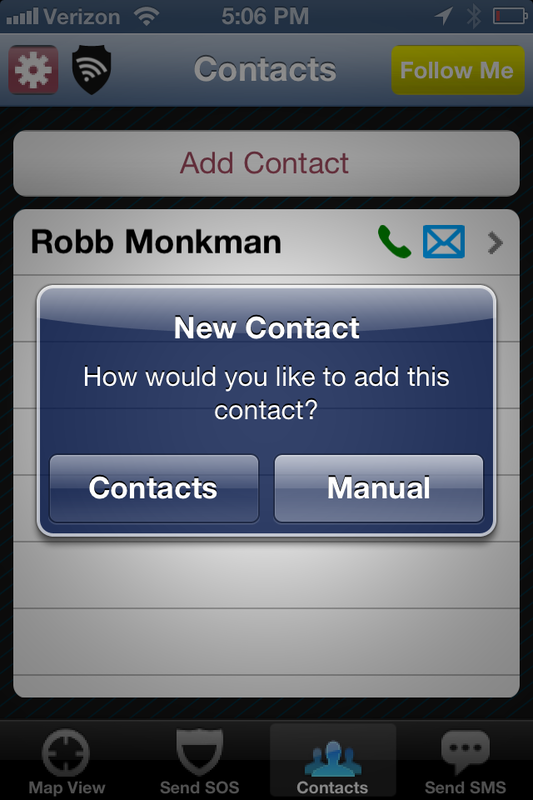 This app allows you to share your location with your contacts as well as has an emergency function that prompts a 911 call button. Another online option I love is ZINIO Digital Magazines. You can get all your favourite magazines delivered right to your inbox. In my case feel free to get me a tablet to read them on too! Lastly an ereader like a KOBO or a KINDLE is a great gift. The gift of reading in a light weight portable package is at the top of my wish list. There are many books that can be downloaded for free, you can borrow ebooks from your local library, or if you are really lucky you'll get a gift card in your stocking! Its perfect for travelling, and fits in your pocket or purse so you can take it with you where ever you go. 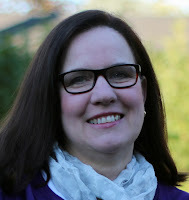 I'm Cathy thinking out loud about Holiday giving. Note: I have not been compensated in anyway for this post. These are completely my own opinions. Free and inexpensive ways to give during the holiday season. We all have bills, and responsibilities. All of us have to watch our pennies, and budget to make ends meet, but if you're like me you still want to find a way to give back, especially around the holidays. I've put together a list of ideas that are either free, or cost very little to give. While it may cost so little, it means so much. Not only will you be helping those in need, spreading love and good will, but you'll also be an example to those around you. Who knows who might be inspired; your kids, siblings, co-workers, neighbours, even strangers. Your local agencies, charities, and shelters are easily located by doing a Google search. This year I've decided to go digital with my Holiday Cards and donate the money I would have spent on cards and postage. Donate gently used clothing to a local shelter or mission so it can be distributed to the homeless and those in need. In particular jackets, hats, gloves, socks, boots, blankets, sleeping bags, knapsacks, and dufflebags. Recently I've seen several posts about filling purses you no longer use with items like mini-shampoos, soap, kleenex, wipes, a toothbrush, toothpaste, feminine products, etc. and dropping them to homeless shelters. Donate gently used clothes, toys and books to a women's shelter. The coffee and the tea from the hotel room and hotel toiletries are also perfect for someone that is in temporary accommodations. I know this because I called a local women's shelter and asked, but each shelter may be different. Take a minute to call and ask what items a shelter near you needs. Baby clothes and items can be donated to teen mother organizations and homes. They are always very much appreciated. Remember certain items like car seats have expiry dates and are generally not accepted. Donate gently used work clothes to an organization like Dress For Success. Donate gently used children's snowsuits, hats, mitts, and boots to a Snowsuit Fund or Snowsuit collection in your area. Canadian winters are cold, and no child should go without a warm jacket. Collect the small bottles of shampoo, soap and toiletries from hotel stays, and/or the toothbrushes, toothpaste and floss you get from your dentist. Donate them to a shelter or to a food bank. Sort the items into into small ziplock bags for easy distribution. Children's books your kids no longer use can be donated to a school library. School libraries get very little by way of budgets to buy new or to replace books. Your donations can go a long way. Same goes for magazine subscriptions; Chirp, Chickadee, Skateboarding and Snowboarding Magazines, Popular Science and Mechanic and Canadian Geographic are all popular with students even if they are a year or two old. Adult novels can be donated to nursing homes or shelters or your local library. If you are donating canned foods to a food drive or food bank make a list watch for sales and use coupons to increase your donation. You can often double the donation by smart purchasing, and who doesn't love a deal! There are lots of ways to donate your old electronics to be refurbished for others, and organiziations like ReBoot, Charity WishList and ERA - Eletronic Recycling Association can help connect your electronic donations with organizations and people who need them. Another option is donating electronics to help organizations fund raise or get money for collecting and recycling certain items. Offer to put Christmas lights up for a senior, or if they no longer drive offer to take them grocery shopping, or to an appointment. Bake some cookies or holiday treats and deliver them to someone who has mobility issues and doesn't get out. Shovel the snow for someone! Especially a senior or a Mom with small kids or baby and can't easily get out. Mentor someone: share your skills, talents, and expertise. Help with a resume. Practise interview skills. Tutor a student. Babysit or Seniorsit and give a tired, overworked caregiver a break. A couple of hours can be so important to managing stress and coping. There you go! A bunch of ideas for giving that doesn't have to cost a lot of money. 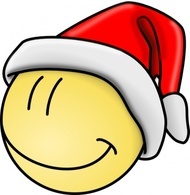 Wishing everyone a joy filled holiday season! Yep, just me Cathy thinking out loud about giving back. Nobody wants to feel scared, especially in their own home. Robb Monkman, the founder of REACT Mobile, was held at gunpoint during a home invasion while he was in college, and he “REACT”ed by creating a “tool that could be used to silently and discreetly alert a wide network, including authorities, of an emergency and its location”. The REACT Mobile app allows you to take a proactive approach to your family's personal safety. There are so many perfect “app”lications or should I say App-locations this easy to use, free app would truly not only make you feel safer but actually be safer. 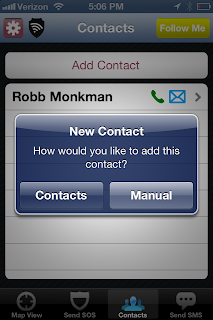 You are in control of who your emergency contacts are, and how they will be notified in the case of an emergency. It could be by email, Twitter or Facebook. 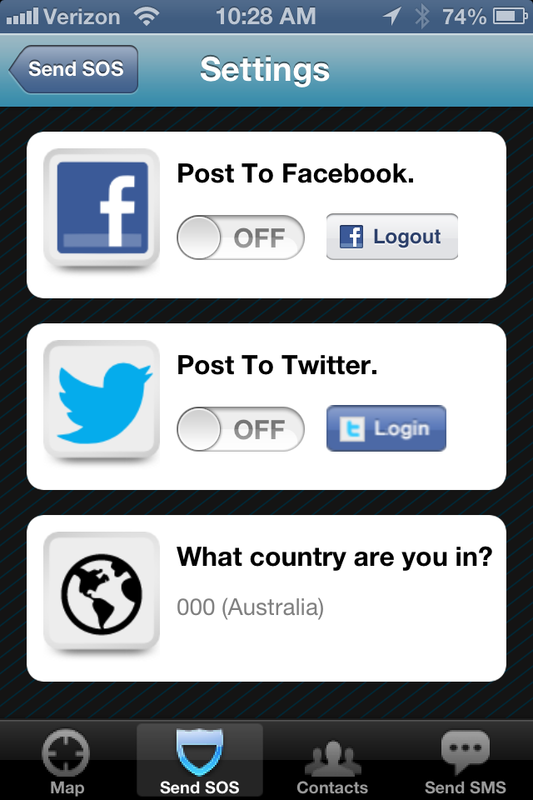 The "Follow Me" feature allows the contacts you select to track your location in real-time. The "I'm Safe" button allows you to let your contacts know you have arrived safely at your destination. It is also a perfect way for your kids to let you know they have arrived safely. By pressing the "SOS Shield" you “send out a panic alert containing a link to your GPS location” to your emergency contacts. 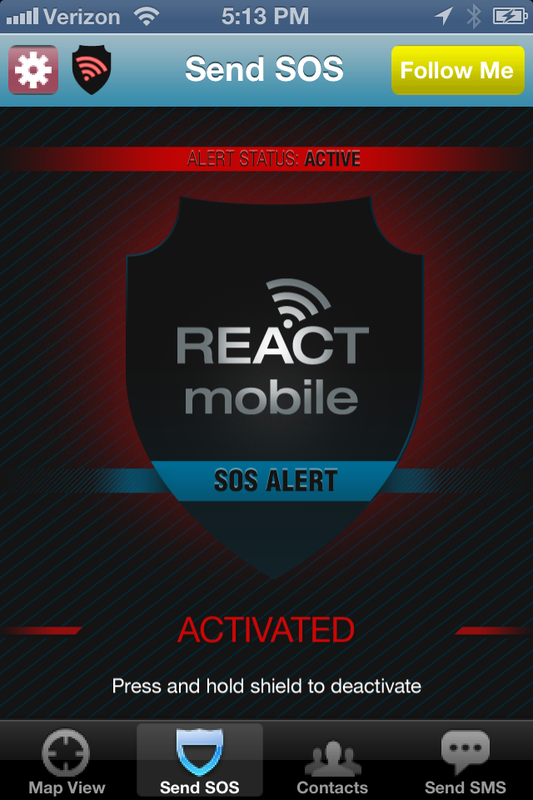 By activating the SOS panic alert “you’re automatically prompted to dial 911”. In an emergency no one wants to be fumbling with numbers or buttons on their cell phone. When my children were young, my husband travelled for work and I would have loved the security this app would have given me in the event of a home invasion, or an emergency. I regularly drive by myself, or with the kids to visit family that live out of town. 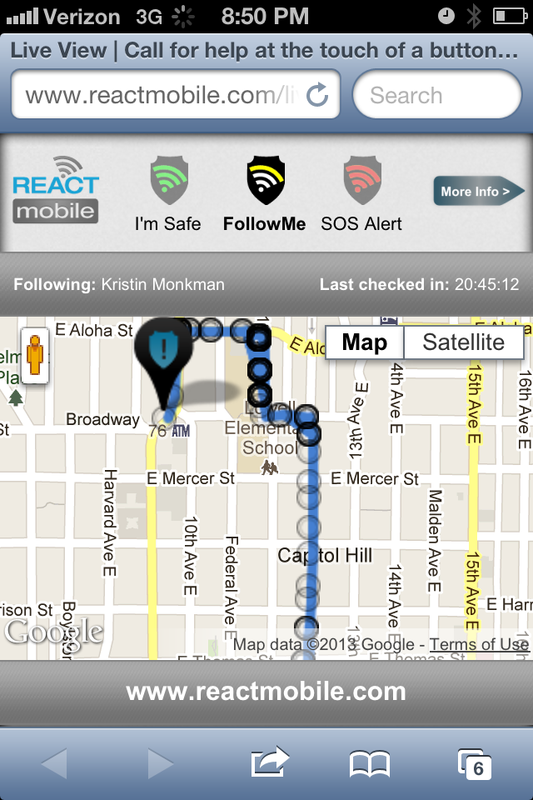 In the event of a breakdown, getting lost, or an emergency the React Mobile app “Follow Me” feature would allow my family at home and at my destination to know I am safe. The React Mobile app is perfect for Joggers and Walkers as well. I love to go for walks in the beautiful parks and wooded areas that surround my neighbourhood, but I am always uncomfortable being on my own, and often encounter no one on these walks. I don’t like to walk the same route for safety reasons, but it also means no one knows the route I have taken. With the React Mobile “Follow Me” feature my loved ones would know exactly where I am. Not only would this be great for me but, now that my kids are older, they come and go much more independently. They take the bus or ride their bikes to activities, or to see friends. I can’t remember the number of times I have told them they must keep me informed of where they are, and the number of times they forget to call and let me know their plans have changed and they are actually somewhere completely different. Should there be an emergency I would have no idea where to start to look for them. Plus, let’s face it I could do without spending Friday and Saturdays nights worrying. The “Follow Me” feature would go a long way to help to eliminate that worry. Be sure to follow React Mobile on Twitter and Facebook for all their updates and news! I am Cathy thinking out loud about React Mobile and Personal Safety. Girls Getaway Shopping Weekends Makes Me Happy! Tomorrow I meet my Destiny! My shopping Destiny! For the past 15 years my girlfriend and I have gone away two times a year for a weekend without Hubbies or kids. On occasion others have joined us, but most times it is just the two of us. For many years now we have gone to Syracuse, New York, and always made a stop at Carousel Mall. Well let me tell you the Mall has been transformed into Destiny USA, and all I can say is WOW! 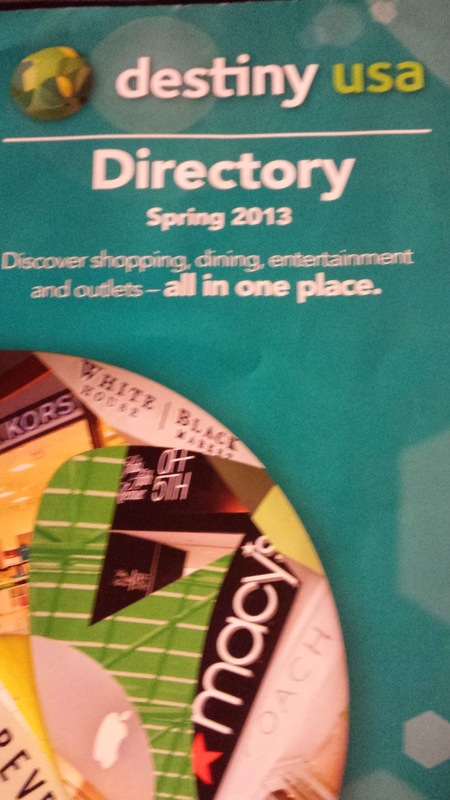 It is bigger and better and new stores are opening all the time in the Outlet "wing" of Destiny USA. I was so excited when I saw this on our trip last June. Mall and Outlet shopping combined into one, plus the WonderWorks will keep the kids busy while you fulfil your shopping destiny! A number of hotels have partnered up with Destiny USA and have Shop & Dine, Shop & Play and Shop & Stay packages. Be sure to stay tuned to find out about all the deals I found, and the delish treats I had to eat on our shopping weekend! NOTE: I have not been compensated for this post, and this is completely my personal opinion. However when I enquired about freebies and deals Destiny USA was nice enough to provide me with a collection of goodies and coupons. #WordlessWednesday - Yep, Same Kid! This is my life....need I say more? I think not! #WordlessWednesday - Yep, that is my kid! This is my life......need I say more? I think not! After listening to my complaining about "fat fingers" and touch screen issues with my cell phone my son was nice enough to give me an Estylo Stylus. The Estylo can be used with any capacitive touch screen device. It is made of wood and, is both light weight and comfortable to hold. Note that the Estylo is weighted different than a regular pencil, but found it took me very little time to adjust to this. I definitely have more control and precision with the Estylo than with my fingers, and use it with both my phone and my tablet for doodling, and drawing. I love how it looks and, it comes in a variety of colours. The price of the Estylo is $20 US which is comparable to other styluses. My only complaint is that it doesn't come with a carrying case so that it is protected when I put it in my purse. I think this would make a great addition to any Gift Guide and recommend you check this out for those with "fat finger" issues in your family. "Estylo is the first and only wooden dual tip magnetic stylus to work on the iPhone, iPad, Android or any touch screen device"
So there you go, I'm Cathy thinking out loud about the Estylo stylus. Note: I have not been compensated in any way for this review. It is completely my own opinion. 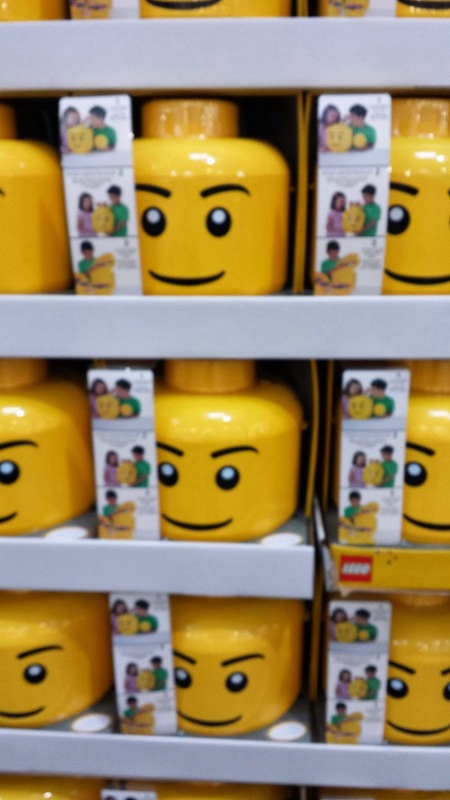 Check out these Giant Lego Mini Figure Head Storage Containers. Not only do it keep all the Lego pieces stored away, but it does so in the coolest of ways! Nothing is cooler than Lego mini figures! I found these at Costco for $28.99.